This week I have had the immense pleasure of playing UK Truck Simulator and have found that it has changed a great deal from it’s predecessor Euro Truck Simulator; not only because you are based soley in the UK delivering cargo, but in UK Truck Simulator there is the option for the player to form their own company once you've carried out enough jobs to afford a garage. You begin with three cities to choose from; Felixstowe, Sheffield and Plymouth. Each city determines the percentage you make from jobs, which is randomised each time you start a new game, and your cut varies around 15%. Upon choosing your city, you are given a truck and your first job to begin with. All deliveries are now timed and should be easily completed in the time limit, which makes the game far more challenging to it's predecessors where you could spend as much time as you liked delivering cargo. Unfortunately it does take a fair amount of dedication before you can get to the stage that you can start up your own company; with a small garage setting you back about £75,000 on top of that you will then need to hire drivers and buy lorries so you really need to save up around £150,000 – £200,000 before you can really start your own business, which is very rewarding to those that are happy to put in the time. Alongside the majesty of owning your own company there are also certain bonuses; for instance fuel and repairs at a garage you own are 20% cheaper than using the public petrol stations and services, in addition to this, by hiring other driver, your money increases a lot faster. When you start up a company you don't have to go to the hassle of finding your drivers jobs, as they are capable of finding work themselves, so all you need worry about is making enough money to upgrade your fleet. Overall the game looks a lot better than previous incarnations and the ability to run your own business is a very welcome feature, giving you a far greater goal. The introduction of roundabouts was very pleasing to see instead of the large amounts of crossroads that appeared in Euro Truck Simulator. The only thing I would like to see is better thought out layouts of cities, as most are the same squares of road. However these do not detract from the overall experience of the game. If the roads held more realistic traffic, and the layouts of the cities were more diverse, I would of definitely given it a 5, however the game's concept is a solid idea so it deserves. 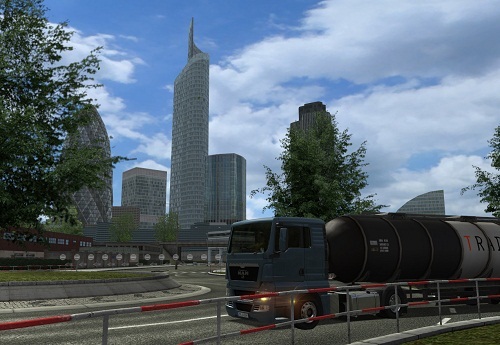 If UK Truck Simulator peaks your interest be sure to check out German Truck Simulator which is out May 28th 2010. UK Truck Simulator game is fantastic I will give it full marks. But can anyone help me please I am looking to buy a steering wheel for the game but I am not sure what one to buy so can anyone help please? Hi Sal can you use that steering wheel with Euro Truck Simulator. Sorry Gary, unfortunately I've not got an Argos catalogue at home, whats the catalogue number so we can look it up? Yeah we have loads of fun playing UK Truck Sim, your questions can actually be summed up in one answer really. Because the game is a simulator the titles are usually made for a fairly low workable budget and so cannot include as much as most standard games will. Pedestrians are a bit of a luxury in simulators where generally the modellers working at the companies specialise in vehicles, and so you will rarely spy a pedestrian in a sim. I've never liked how you are deducted points and cash for other cars bumping into you, and I'm never really sure why they implement that in the games, but I suppose it's their design choices. As for the roads again, it is a simulator and so the games themselves cannot be too large, and so unfortunately the driving space is limited by the size of the game it is a shame but you'll just never drive down them. Hope that answers your questions as best I could Anthony. great game, guys excellent has always, from a person who been through most of the hard truck series, this is the one i most enjoy. has for steering wheels i have a g25, best choice at the moment who be logitech steering wheels.g25/g27/gt force. look at argos i couldn't see any products in there online catalogue for pc. I just played Euro Truck Simulator starting in the U.K. I noted where I was at various times. 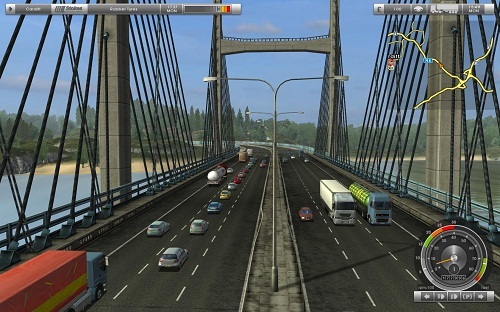 Now, when I play this simulator, I will note where I was when I played Euro Truck Simulator. I am basically creating a virtual story. The story of the entrepreneur in the U.K. and the European entrepreneur who occasionally run into each other. I can't wait to see how this turns out. how do you get employees to get and deliver cargo??? Jess, you need to buy them a lorry, then they'll do the rest by them selfs.